We offer a range of digger attachments, including Flail Mowers, Mixing Buckets, Stump Grinders, Pile Drivers and Log Splitters! Hydraulic flail mower heads, mulchers and hedge-cutters for excavators from 1,2 to 25 ton. We offer flail mower heads with high-performance hammers and knives. They are suitable for clearing hedgerows, brambles, grass and branches. Ideal for cleaning Small holdings, Equestrian Centres and ground keeping of parks or gardens in general. Every flail mower head can be supplied with standard mounting bracket ( 2 pin ) to fit directly onto the boom of the excavator or with quick hitch mounting bracket with or without pins. For more information, please contact us and we will happily guide you to the correct product for you. Mixing cement and having it available where you need it, when you need it and in the right amount has never been easier. The special auger design, pushes the mixture towards the centre of the bucket providing a perfect mix of cement. 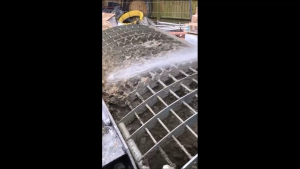 This ‘forced’ mixing means better quality concrete compared with that of standard mixing buckets which work with a system where the concrete falls from the sides of the bucket into the mixer. Pour the concrete using the bottom discharge gate hydraulically operated with an electric control (you activate it from the digger) . You can plug the rubber pipe on for accurate discharge into post holes or farm work.